Oh, what fun it is, to ride, on a two-wheeled-touring-rig-pulling-a-beast-of-burden name ‘BOB’. Seriously tho’, it’s a breath of fresh air to finally be back on the road, after what? Four months? 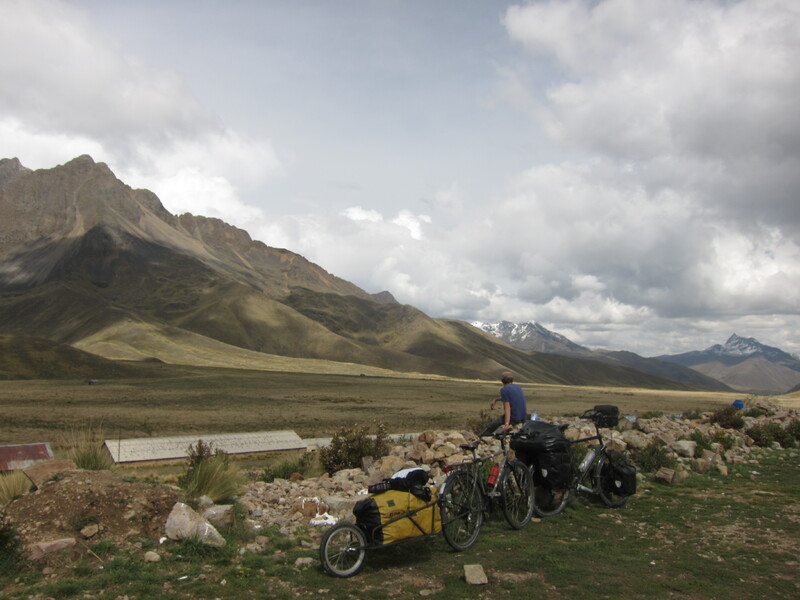 Our route increased in elevation since Cuzco, Peru (at 3,400 m/ 11,200 ft). Taking a rest break. We had reached the highest point, for that day. 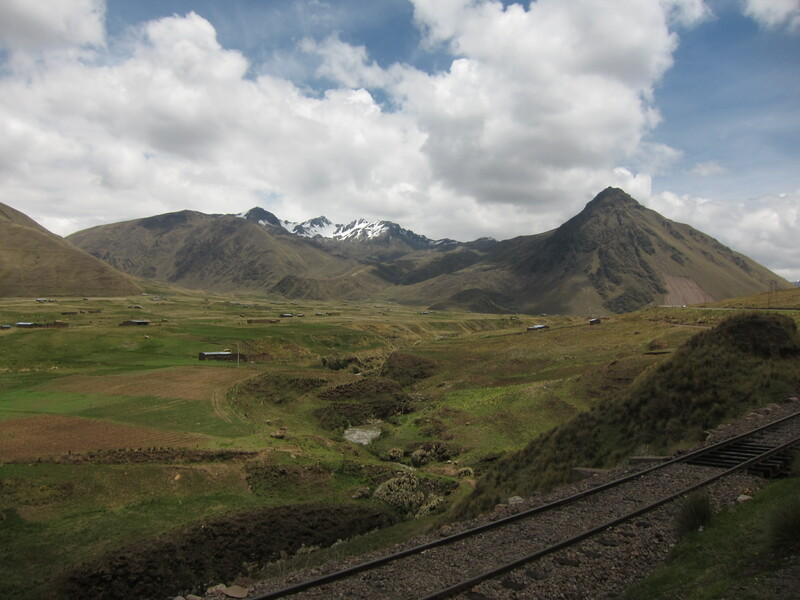 We say good-bye Peru’s southern sierras and soon to the Andean Plateau (Altiplano). 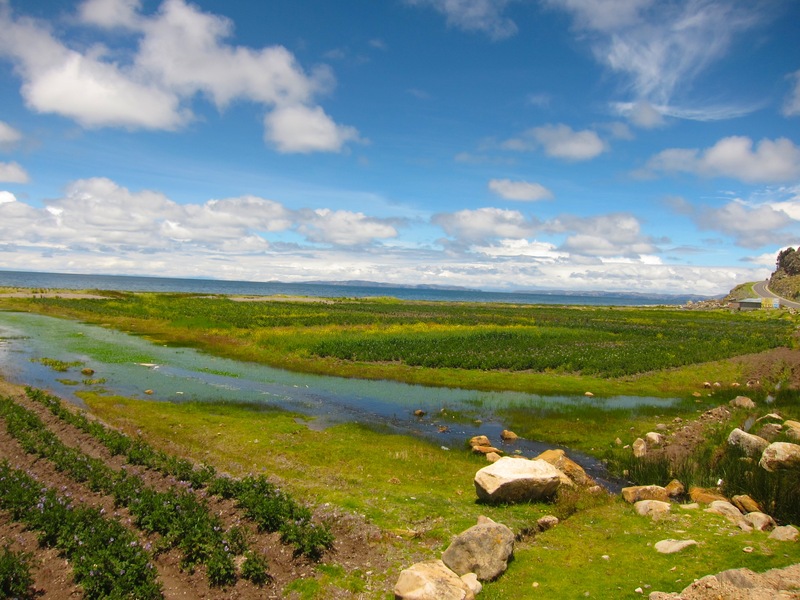 After a few days of a taste of the Altiplano, which is wind and sunburned exposure and shortness of breath, we rested in the last city of Peru, Puno. 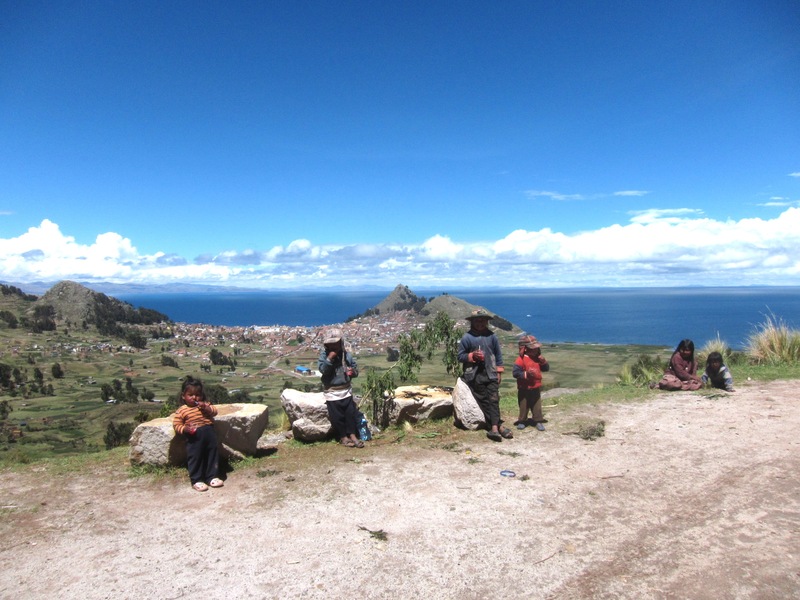 Here was our hotel with a view of the west side of Lago Titicaca. I arranged to have dental work in the next town, Juliaca. For the work of getting a wisdom tooth pulled, three teeth with cement sealing, and the general check-up: the dentist, Gary, made me a kind quote of less than 30 USD. Huge thanks to him, for the professional care. No infections.. and so far no after-complications. In the morning, our route brought us closer to the lake. There were wetlands and sections of crops between the lake and the road. It was Sunday. Many farmers and families were out tending the crops. 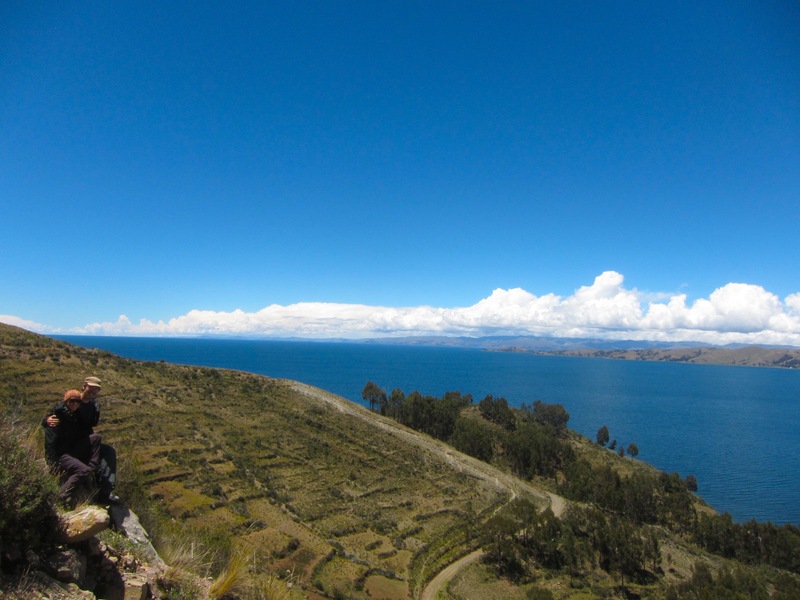 A moment to relish the beauty and vastness of Lake Titicaca. Somewhere over there, we have yet to discover, Bolivia. 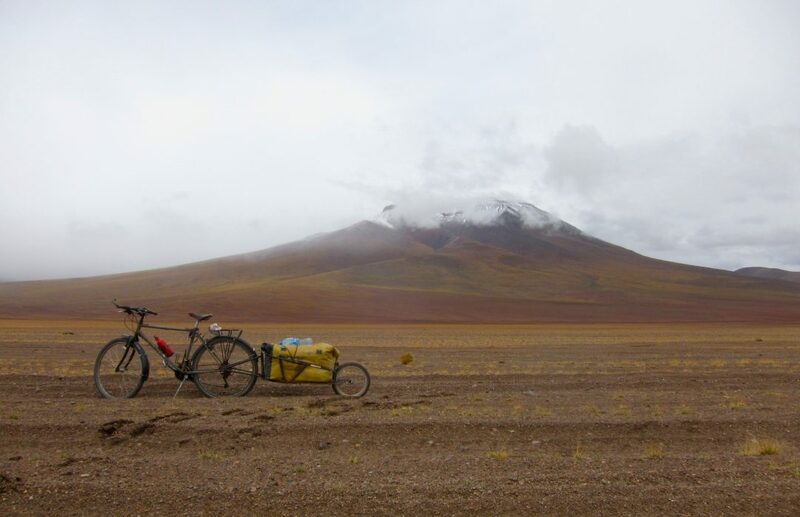 After a long day ride.. finally we arrived to the Bolivian border. And as a USA citizen, I ‘proudly’ get to pay my way into the South American countries. It’s just $135 greenbacks.. It my sarcasm obvious? It’s a BIG BOO!!! For charging foreigners a fee that’s equal to a months rent, (and no refund if their disqualified to enter) we traveling citizens have to pay for the counter-punch of this ‘reciprocity’ fee.. thanks ‘Merica, from all of us citizens and foreigners.. And Feliz Navidad, Bolivia. 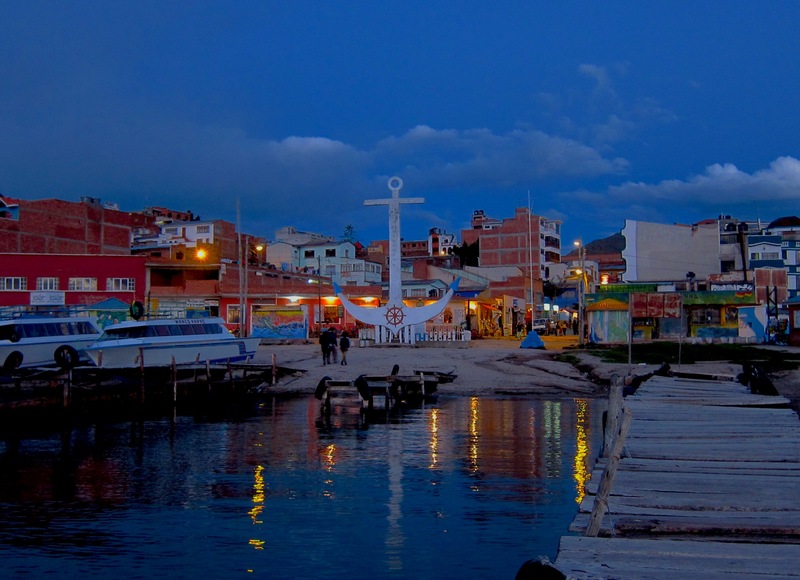 For a few nights, we rest in our first Bolivian town, Copacabana. Twas only the final days before Christmas. Our Christmas was very mellow; phone calls to the families, watching sunset on the lake, and a Christmas movie that was cornier than I remembered. 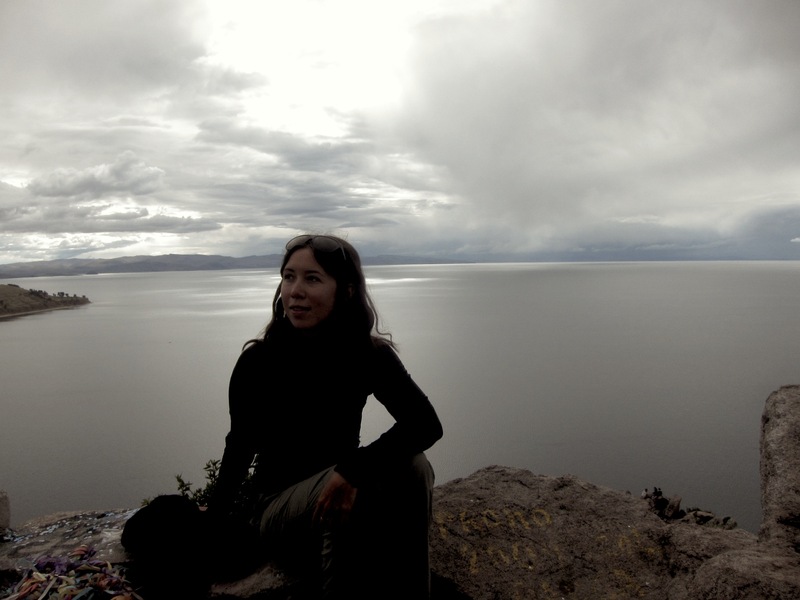 A hike up 250 meters for a view on the lake. The clouds rolled in. Yes, the rain season has arrived. On Christmas day, we cycled out of Copacabana. On the road side there were Bolivian children, from the remote rural, around the lake. Apparently, on Christmas Day, these kids are here to receive holiday handouts from the drivers who commute between the cities. Many on the kids interacted with us, from sweet “hellos’ to down-right annoying boys who played ‘dare-devil’ by running in front of us. Sad as it may sound, this was their Christmas day. Less riding for more moments to sit and enjoy the views. 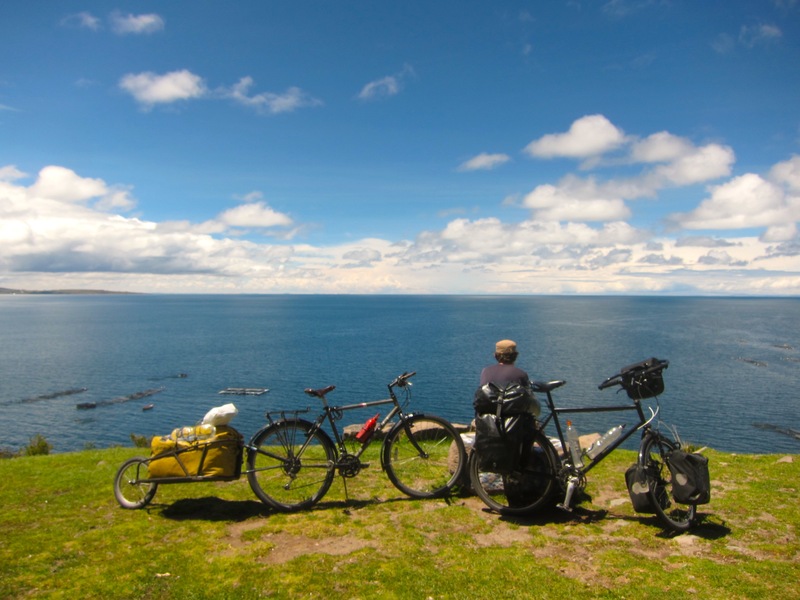 It’s been nearly more than 3 days commuting with the view of Titicaca. It’s huge! After some 30 kilometers from Copacabana, the road meets lake. We had to board the ferry to reach the other side to continue the route to La Paz. 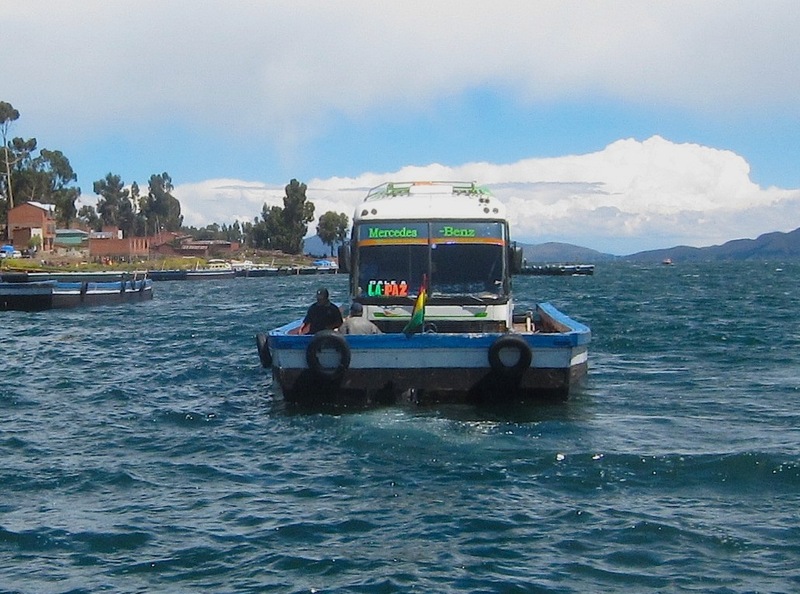 These “ferries” are indeed some ramshackle planks, with a load capacity of 1 or two Mercedes Benz buses (Bolivian retrofitted) and a few extra locals and gringoes. I went to pick up snacks before departure, however, I returned to find the ferry, Paul and the bikes departed without me. No worries- just had to the following ferry. What was slightly concerning, was to witnessing the old boards and nails grate under the pressure of the waves and the fully loaded buses. Without capsizing – we all made it to land. 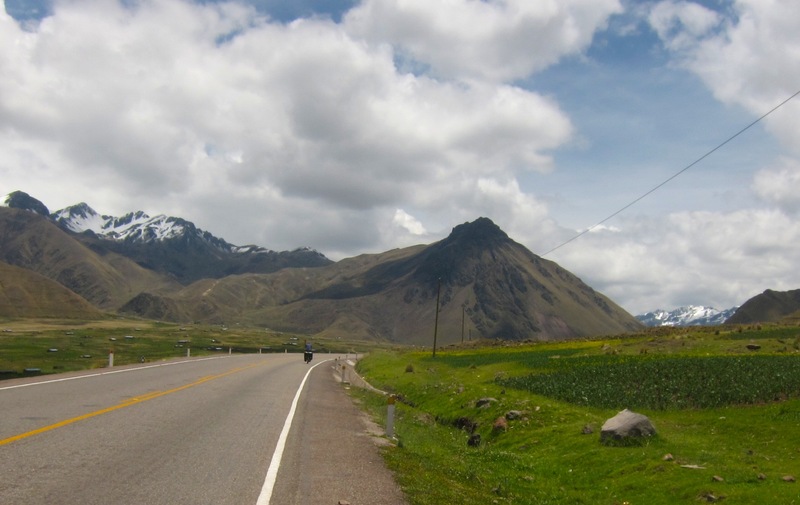 On the road to La Paz, we completed more kilometers before callin’ it a day. Crowded on the lakeside, it was rare to find a secluded zone, but we managed. An excellent tent set-up with view on the lake and the snow-covered mountains. 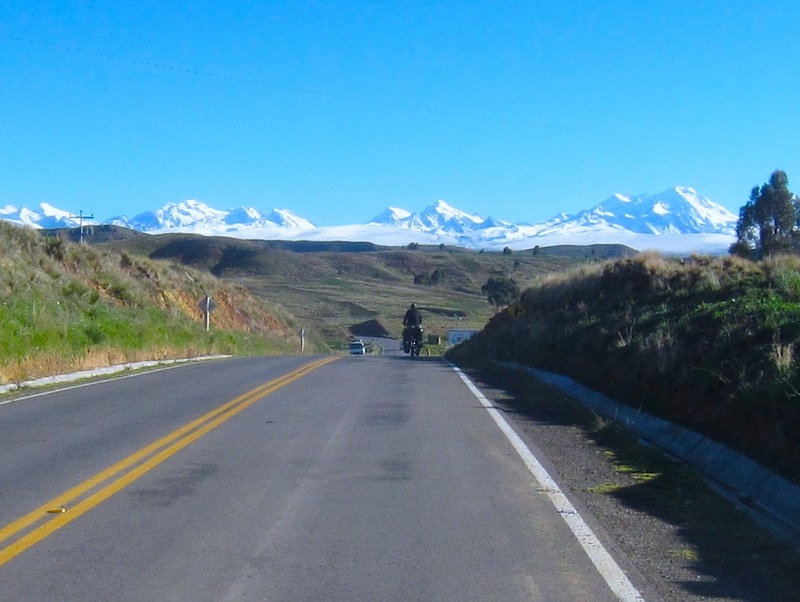 The next morning, a turn-off brings us to one of the most amazing views of this weeks journey: The Bolivian Cordillera Real mountain range before the lake and Altiplano. 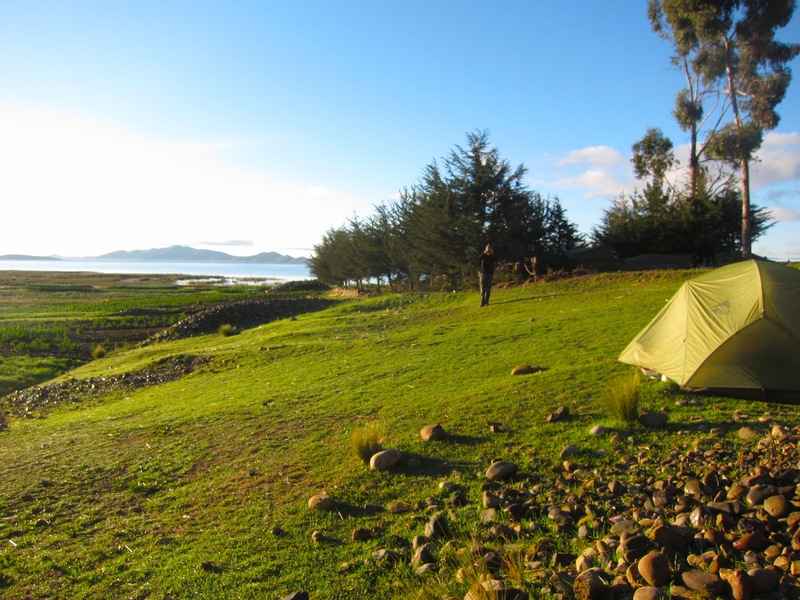 The morning was pleasant, the afternoon brought rains- typical of this early rain season in Bolivia. 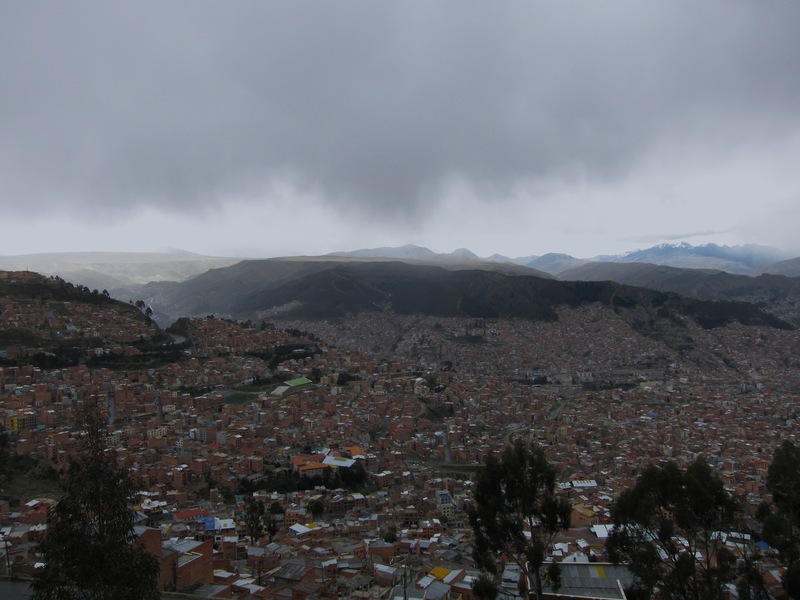 We dashed through the most uncomfortable mix of afternoon rain and passing through the town of El Alto. 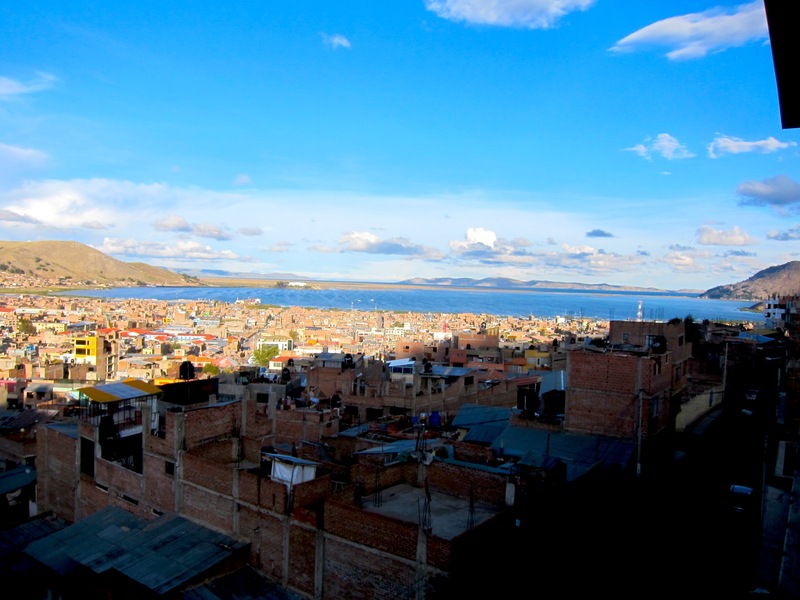 El Alto is the previous industrial town most will pass before La Paz. Familiar to us as the phase of cycling though the grimiest-traffic-congested outskirts before reaching the core of the mega city. It was yet another harsh ride into a country capitol, on yet another rainy day (Mexico city, Medellin..) but we had arrived to La Paz. 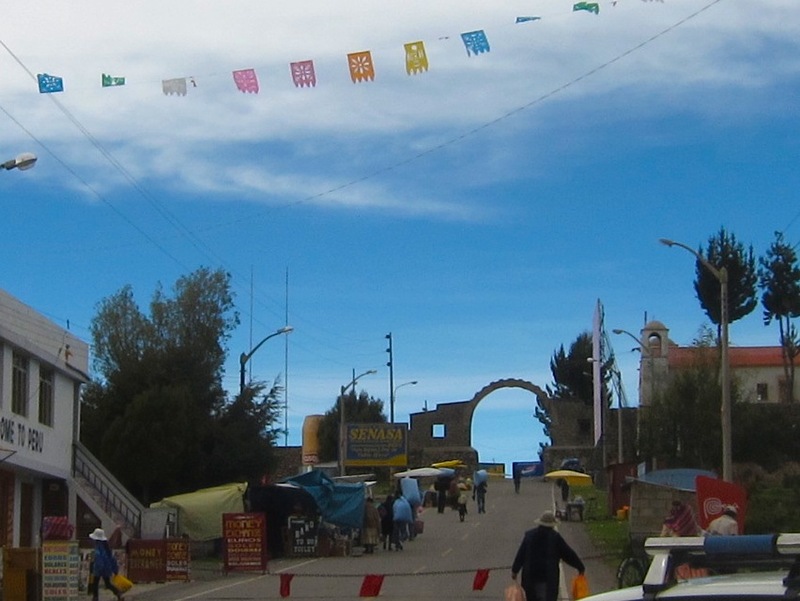 At 3,660 m/ 12,000 ft, it’s the highest “unofficial” capitol city of the world. With that said.. we’ll take it! Stay tuned for the next chapter… which will come sometime in the year 2014, when we reached civilization.. perhaps in the next country, or in Bolivia.. if we are lucky. Happy holidays, and to a adventurous new year, 2014! Previous: Previous post: Machu Pikchu… brought to you, by, Saṃsāra! Next: Next post: Flamingos and snow in the desert? Pink and white lakes? Where are we?